Embark on a culinary voyage through the Andes. Weaving traditional ingredients into a bold new culinary approach, Senzo sets itself apart from other Cusco restaurants. We champion delicate flavors and freshly sourced ingredients, while modern twists offer new interpretations of Peru’s rich culinary heritage. Senzo serves up exceptional cuisine in a vibrant yet refined atmosphere. With a stellar reputation among Cusco restaurants, our talented chefs rework classic recipes into a bold celebration of taste and texture. Whether you’re joining us for an à la carte dinner or flavorsome breakfast, delight in the freshest vegetables, fruits and seeds that sit at the heart of Andean cooking––and our own hotel garden. Revive in style beside Cusco’s only open-air heated pool. The perfect go-to spot any time of the year, Senzo Bar tempts tastebuds with a selection of colorful dishes and an extensive Pisco menu. Satisfy your appetite with a nutty quinoa salad and crisp glass of wine. 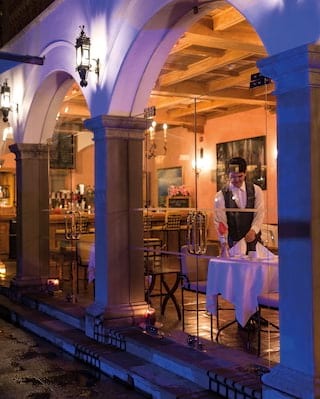 While staying at Belmond Palacio Nazarenas, enjoy the renowned restaurants at Belmond Hotel Monasterio, our elegant sister hotel. Discover the alfresco atmosphere of Illary Restaurant. 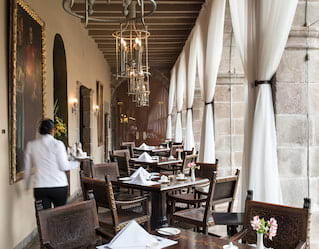 In a lush courtyard fringed by ancient cloisters, seasonal Mediterranean cuisine is served with Peruvian flair. Alternatively, enjoy a different kind of Cusco nightlife at El Tupay. 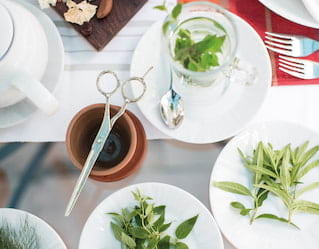 Delicate French flavors and bohemian nights with local musicians set a unique multi-sensory tone. Whatever your preference, a Pisco Sour in the ambient Lobby Bar is the perfect place to start.